The Zafarani Files "Hard Cover"
An unknown observer is watching the residents of a small, closely-knit neighborhood in Cairo's old city, making notes of their comings and goings, their quarrels, their triumphs, descriptions of dress and biographical details. The college graduate, the street vendors, the political prisoner, the cafe owner, the taxi driver, the vegetable seller, the ironing man, the baker, the beautiful green-eyed young wife with the troll of a husband - all are subjects of surveillance. The watcher's reports flow seamlessly into a narrative about Zafarani Alley, a microcosm of Cairene urban life that is a village tucked into a corner of the city, where intrigue is the main entertainment, and everyone has a secret. The mysterious Sheikh Atiya has cast a spell over Zafarani Alley, and the men are all cursed with a loss of virility; the women, gossiping on their balconies, are afflicted with despair. 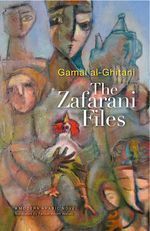 Suspicion, superstition, and a wicked humor prevail in this darkly comedic novel by the well-known writer and journalist, Gamal al-Ghitani, author of Zayni Barakat.